I like to experiment with different elements in socks. That’s how I came across my favorite heel – the double-stitch short row heel. And also how I came across my new least favorite toe – the spiral toe. I’m not really sure what purpose this toe serves, since it ends up pointy like a carrot. And I don’t have carrot shaped feet. And don’t know many people who do. Spiral toe, perfect for the carrot people. To make the spiral toe, not that I think you should, but just in case you have very pointy toes, or maybe an extra long second toe. 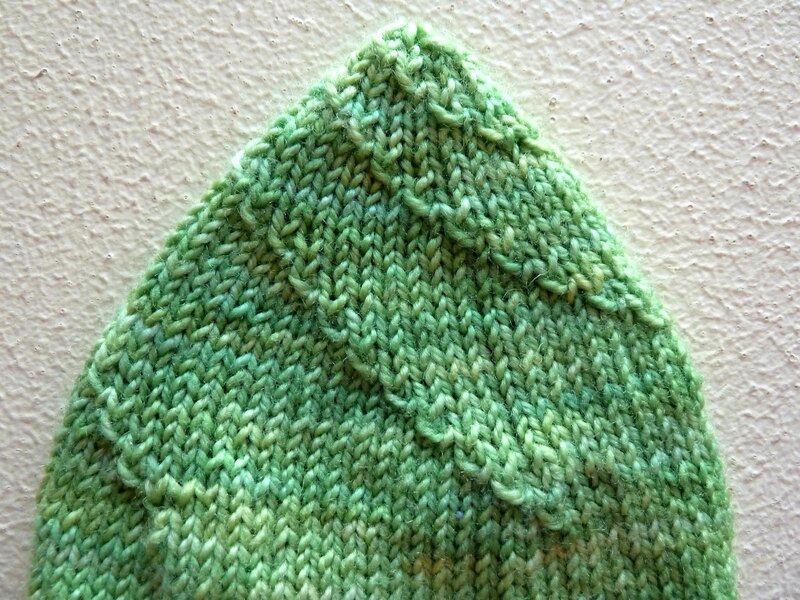 Divide stitches evenly over four needles. Rnd 1: ssk at the beg of each ndl, K rem sts. Knit one rnd even between each decrease rnd. Each additional rnd add one more stitch before the ssk. When you get to the end of the needle, start again at the beginning until 8 sts rem. Cut yarn, weave through sts, pull tight. Weave in ends. Have you ever knit this toe? What did you think?